Hello Everyone Aaj ham Aapko Social Media Ke Sabse Populer Site Facebook Ki Security Ke Bare Me batane Waale hai, Facebook 2-Step Verification Kaise Enable Karte hai, Sabko pata hai Facebook Pure Word Me Sabse Popular Social Site hai, Jiske Dwra Hum apne Friend , Family Se Text Chat, Video call Bhi kar sakte hai, But Kya Aapne Apne facebook Account ko Safe kar rakha hai agar nahi to kar lijiye. Waise to Facebook Bahut Secure aur Bharosemand Social Site hai, aur Koi Ishe Jaldi Koi hack nahi Kar sakta hai, Aur FB bahut Trusted Site hai Jo Hamare Personal Information Ko Kabhi Bhi Kisi Ke pass Share Nahi karta hai But Phir bhi Aapko Hamesha apni Security Ko Update Rakhna Chahiye. Facebook Account Hacked होने पर क्या करें ? Facebook Se Gas Book Kaise Karte hai ? 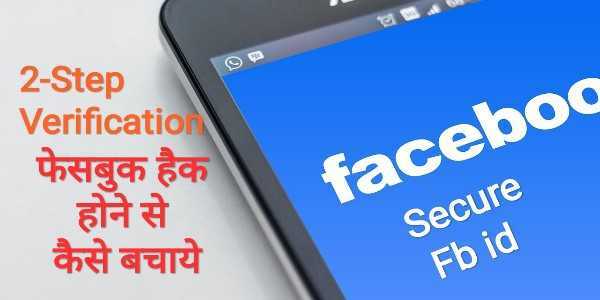 Doston aapne Facebook Me Kayi Privacy Feture Dekha Hoga aur Bahut Se Blog Par Iski Jankari bhi Dekhi hogi, But Facbook 2 Factor Authentication Sabse Best hai, Aapki Facebook Privacy ke liye, i am Sure Facebook me 2 step Verification Enable karne ke baad Koi Bhi aapke Facebook Id ko Hack Nahi kar payega, Two Step Verification Lagane se Pahle Hum Iske baare me Jaan lete hai ki 2 Step varVarifficat Kya hai. Facebook Videos Download Kaise kiya jata hai ? Facebook 2-Step Verification Kya hai ? 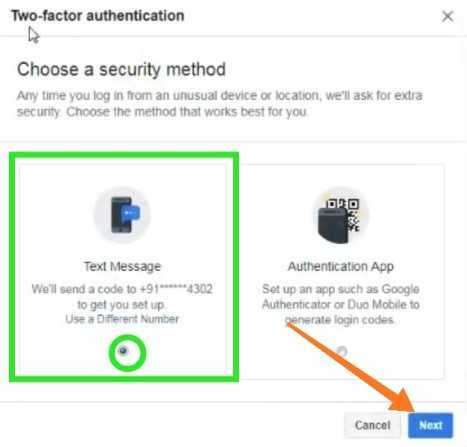 Two Factor Authentication ya Two Step Variffication Aapke Account Twitter, Facebook, WordPress, Gmail, Jaise Account Ko Secure Banane ke Liye hai, Ye Ek Aisa Protection hai Jisko Enable Karne ke Baad Us Account Ko Login karne ke Liye Aapko OTP ki Jarurat Padti hai, Aur OTP aapke Us Account Se Registered Mobile Number Par Aata hai, Agar Aap OTP Ke Dwra 2 Step Variffication Lagana nahi Chahte to Google 2 Factor Authentication App Download karke Uske Sath Two Factor Authentication Use Kar sakte hai. 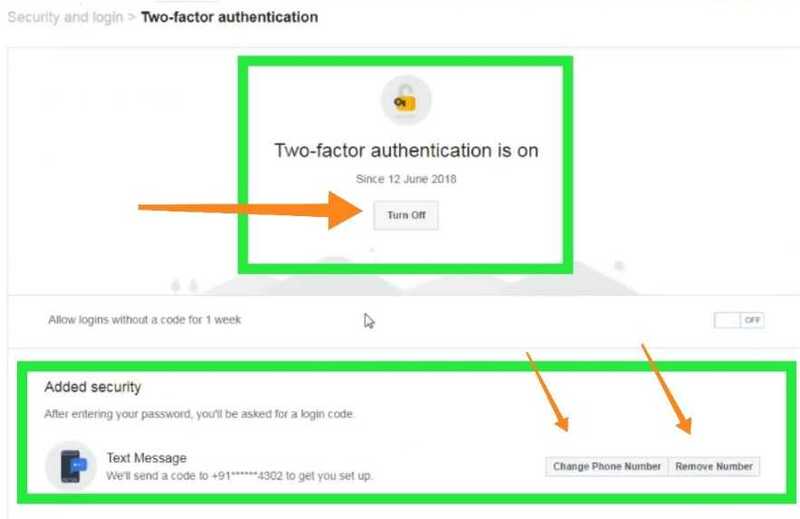 2 Factor Authentication Apps Se Enable Karne par aapko App Jab bhi aap Fb account Login Karenge to Usme 10 Secend ke liye Code dega Jise aapko Use karke Login karna hai, har 10 Secend me Code Change hota Rahta hai. Facebook Me Lock Kaise Lagaye ? Facebook 2-Step Variffication Enable And Activate Kaise Kare ? Agar Aap Soch Rahe hai Ki Hamara FB account Koi Hack Na Kar sake To aapko Facebook Account ko Lekar Advanced Rahna hoga, But Agar aap 2 Step Variffication Enable and Activate kar lete hai to Koi bhi aapki Fb id Hack nahi kar payega. इंडिया में घूमने के लिए सबसे अच्छी जगह कहा है ? Yadi Aapki Fb id Ka Password bhi Kisi Ko Pata Chal jata hai tab Bhi Wo Aapka Kuch nahi kar payega Kyuki Ushe Login Karne ke Liye Mobile Number Par Aane Waale OTP ki Jarurat Hogi Aur OTP Aapke Registered Mobile number par Recive hogi, Chaliye Jaan Lete hai Mobile Number OTP Varify 2 Step Variffication Enable and Activate kaise karte hai. First aapko Apni Facebook Id ko Login kar lena hai Login krane ke Baad Right Side Ke Menu Optione jana hai Menu me Setting ka Option milta hai Uspar Click karen. Jaise hi aapke Facebook ki Setting Open hoti hai, To Aapko Ek Security Ka Option Milta hai Just Uspar Click karna hai. Security Setting Open hone ke baad Aap Dekh Sakye hai Login Alert Me 2-step Verification Ki Sabhi Feture and Option Diya gya hai. Ab Aapko Use 2 Factor Authentication Ka Option Milega Just Uspar Click Karna hai. Aur Iske baad New page Open hoga, Jisme Get Started Ka ek Button Milta hai Jo aap Image Me Dekh Sakte hai Uspar Click karen. Jaise Hi aap Get Started Par Click Karte hai, New Page open ho jata hai Choose A Security Method Yaha aapko 2 Option Milta hai, Jiska Matlab hai Aap login 2-Step Verification OTP Mobile Number Par Karna Chahte hai Ya Kisi Authentication App Par. 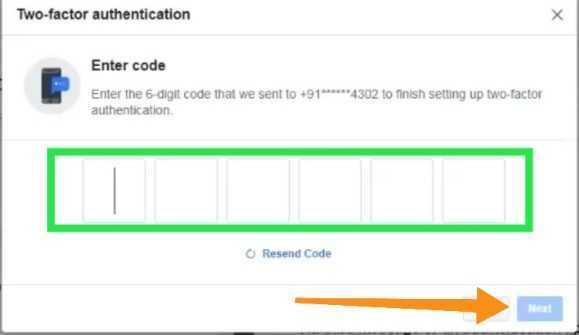 To yadi Aap Chahte hai Ki aapke Fb Se Registered Mobile Number Par OTP To Text Massage par Click Kar sakte hai Aur yadi aap Chahte hai FB Login Verification Code Third-party Authentication app Jaise Google Authentication ya Authy App Par Aaye To aapko apne Device me App Download karna hoga, Iske baad Next Button Par Click Kar de. Jaise Hi aap Next button par Click Karte hai, Niche Image Jaisa Dikhayi Dega Aapke Facebook se Registered number Par ek Verification 6 Digit OTP gya hoga Jise aapko yaha Enter karke apne Number ko Verify karna hai. OTP dalne ke Baad Next Button par Click kar de. 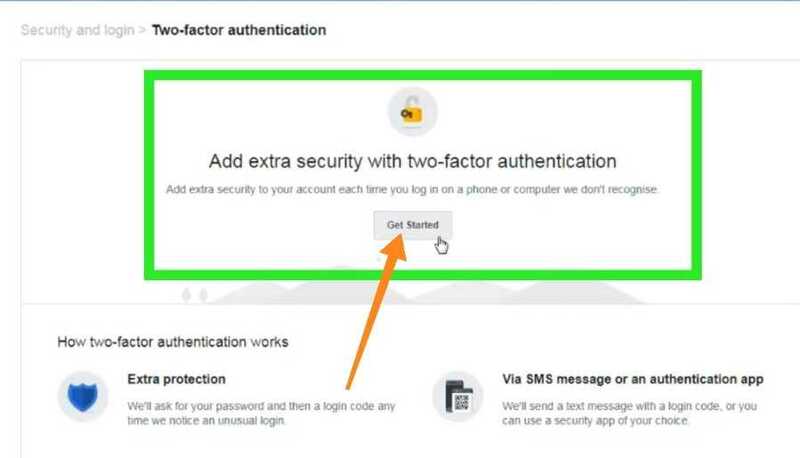 Ab Next aapko 2 Factor authentication On Ka Section milta hai isme aapko off kar dena hai Yadi aap Ise On karte hai to 1 Bar Aaye Login OTP 1 Weak Tak Work karenga. Ye sab karne ke baad Last me Finish Ka Button milta hai Just Uspar Click Kar dena hai. 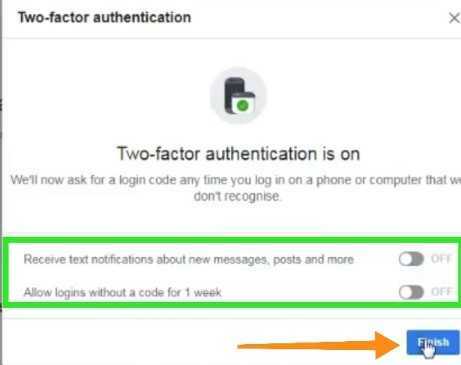 Ab Next aapko image Me Dikhaye Jaisa Page Open hoga Iska Matlb aapne Succesfully Facebook me 2 Factor Authentication Activate kar liya hai, ab aapko Yaha Turn Off ka Option Show hone lagega. Yadi aapko OTP Recive Mobile Number Change karna hai Ya Remove karna hai To Niche Option diya gya hai Change kar sakte hai. Aadhar Date of Birth Change कैसे करें ? Bank Account Band karne ke liye Hindi Application kaise likhe ?